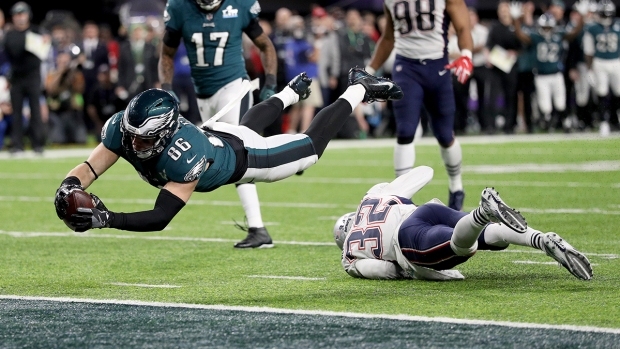 An estimated 103.4 million people watched the Super Bowl on NBC, a 7 percent drop from last year that indicates that television's biggest event may have peaked in popularity. The Nielsen company said it's the smallest Super Bowl audience on television since 2009 despite the underdog Philadelphia Eagles beating the New England Patriots in a thrilling game that was close from start to finish. Last year's Patriots-Falcons game reached 111.3 million viewers. The all-time Super Bowl record — and record for any television event in the United States — was the 114.4 million who watched the Patriots against the Seahawks in 2015. The NFL's viewership has been down this year, with experts citing factors like increased injuries, some confusing rules changes and anger at players protesting police brutality by kneeling during the national anthem. Similarly, fewer people have cable than they did a few years ago, with streaming onto hand-held devices becoming more popular. The dip was also telegraphed by a poll conducted last week by Seton Hall University, which found that 54 percent of Americans were preparing to watch the game. That's down from the 68 percent that said the same thing two years ago, according to the poll, which wasn't done in 2017. The poll has a margin of error of 3.8 percentage points. Despite that prediction, the poll's director said he thought the game's quality would lift the numbers beyond what was actually seen. "If you turned the game on at any time to say, 'I wonder what's going on,' or a friend texted you to say you should watch this, you're going to watch and get hooked," said Rick Gentile, director of the poll, also sponsored by the Sharkey Institute. NBC said that if you add in people who followed the game online, viewership increased to 106 million. And Nielsen said it has not yet counted the number of people who watched the game outside of homes — in a bar, for instance. Some perspective: despite the decrease, Sunday's game ranked as the 10th most-watched television even in U.S. history. Soothing any hurt for NBC was Kantar Media's estimate that $414 million was spent on advertising for the Super Bowl telecast. That's second only to the $419 million spent last year, a figure that Kantar said exceeded 2018 only because last year's game went into overtime, meaning there was more time to sell ads. Justin Timberlake's halftime show, despite tepid reviews, drew an audience of 106.6 million people, Nielsen said. NBC's post-game telecast of "This is Us" was a winning choice. Nielsen said 27 million people stayed for the drama, the most-watched post-game entertainment show in six years and sharply above the 17.6 million people who watched the premiere of "24: Legacy" on Fox last year. And extra kibble is being handed out over at Animal Planet. The cable network's annual "Puppy Bowl" of cute animals, shown opposite NBC's pregame show, reached 3.05 million people. That was the show's biggest audience in its 14 years of existence.